Many businesses spend a disproportionate amount of time tweaking copy, design and interactive content for their homepage. Yet they miss the fact that the action is increasingly elsewhere. Homepage traffic has traditionally been seen as a proxy for ‘brand’ searches – especially when the actual search terms driving traffic are ‘not provided’. Now, brand search traffic may be finding other landing pages directly. 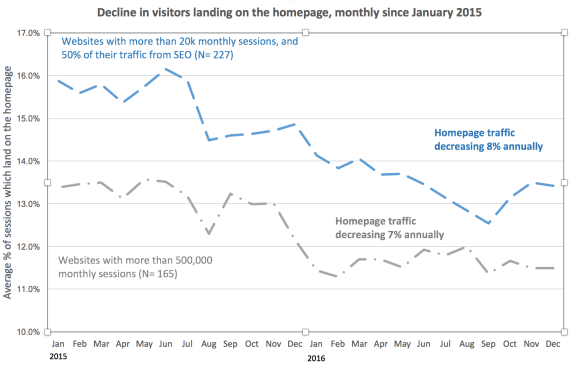 Our hypothesis was that over the last 2 years the number of visits which start at the homepage, on the average website, are decreasing. In both categories, we found that the proportion of visits which landed on the homepage was decreasing: by 8% annually for the smaller sites (from 16% of total visits to 13% over two years), and 7% annually for the larger sites (from 13% to 11%). If we ignore the slight rise in homepage traffic over the November/December period (presumably caused by more brand searches in the Christmas buying season), the annual decline is more than 10%. From the larger websites, only 20% showed any proportionate increase in homepage traffic over the 2 years – and those were mainly websites that were growing rapidly, and with an increasing brand. Increased sophistication of Google search usage is leading to more long-tail keywords, where users want a very specific answer to a question – usually not given on your homepage. That Google’s search-engine result page (SERP) changes have made it less likely that brand searches (searching for your company or product names) will navigate to your landing page – and instead browse social profiles, news, videos or even local listings for your company. In conclusion, it seems that for many businesses the homepage is an increasing irrelevance to the online marketing effort. Spend some time on your other content-rich, keyword-laden landing pages instead! And would you like to see if you are overly reliant on your homepage traffic, compared with similar websites? Try Littledata’s reporting suite.